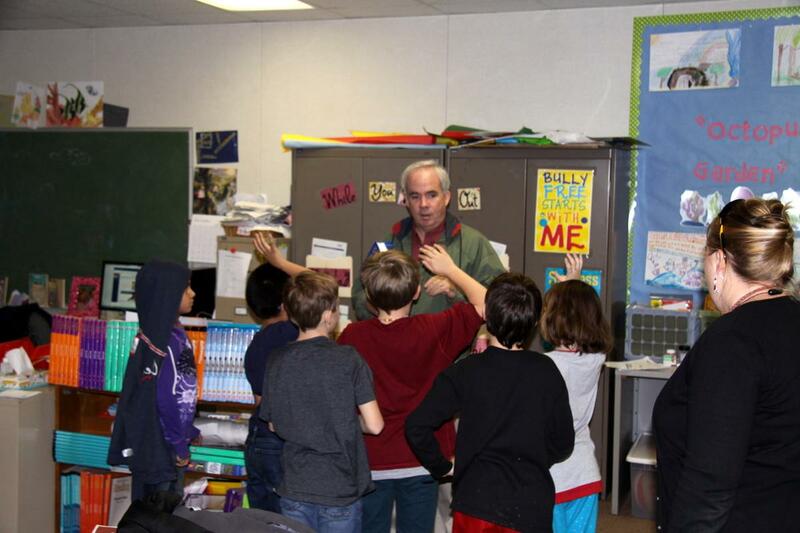 Never loosing sight of his day job responsibilities Ione Rotary Club President and Amador County Assessor Jim Rooney asks his audience of third grade students, “How many of you are registered voters?” in eager anticipation three raise their hands. Elementary School Principal Jeni DeWalt looks on as these Macmillan Co. “Dictionaries for Children” are handed out. These are often the first personal book they have received and each one is inscribed with their name. Every year two or three of the kids will comment that they have been waiting patiently for their own volume because their brother’s or sister’s copies haven’t always been shared. Approximately 95% of the funds raised by the Ione Rotary stay in our community with the balance going toward Rotary International projects such as the eradication of Polio and providing clean water to rural villages. Your support of our fundraisers is much appreciated. Tickets for our annual Crabfeed Dinner, Silent Auction and Raffle being held Saturday February 7th at Evalynn Bishop Hall in Ione’s Howard Park are now on sale. For ticket deliveries please call 209-274-2123.